For anything more than casual use you need a tripod that's very stable, strong enough to withstand some serious abuse, and yet moves with fluid smoothness. 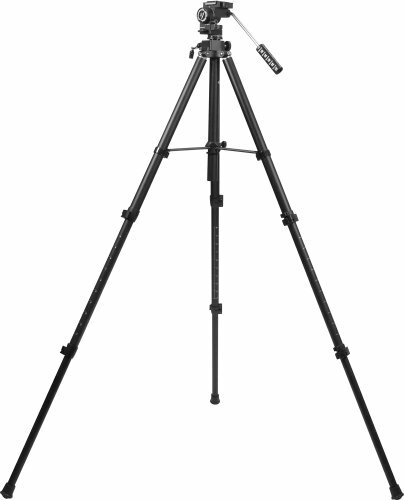 Our Paragon professional tripods fill the bill, providing heavy-duty support for giant binoculars, cameras, spotting scopes, and telescopes such as the Orion ShortTube 80 Refractor telescope, Apex 90, 102 and 127 Maksutov-Cassegrain telescopes, spotting scopes, and Resolux and Giant View binoculars. The Orion HD-F2 Paragon Tripod is constructed almost exclusively of aluminum, making it stronger at key stress points where other tripods fail. It features large, adjustable aluminum-tube legs with robust lock levers for convenient setup and takedown. Each leg features graduated reference etchings so you can quickly and easily extend each leg to the same preferred length - a great timesaver when trying to setup gear in a hurry. The legs are tri-braced to the center elevator housing for extra stability. The tripod is 72" tall when fully extended, putting binoculars easily at eye level for most people. View More In Complete Tripods.